Synthetic peptide corresponding to Human LIS1. Represents a portion of human Lissencephaly 1 (Lis 1) protein encoded in part by exons 3 and 4. TF-1 (erythroleukemia cell line) cell lysate. Our Abpromise guarantee covers the use of ab2607 in the following tested applications. ICC/IF: Use at an assay dependent dilution (see PMID: 17314247). IP: Use at a concentration of 2 - 10 µg/ml. WB: 1/300 - 1/3000. Suggested working dilution of 1/1000 (see PMID: 17314247). IHC-P: Use at a concentration of 2 µg/ml. Perform heat mediated antigen retrieval before commencing with IHC staining protocol. Required for proper activation of Rho GTPases and actin polymerization at the leading edge of locomoting cerebellar neurons and postmigratory hippocampal neurons in response to calcium influx triggered via NMDA receptors. Non-catalytic subunit of an acetylhydrolase complex which inactivates platelet-activating factor (PAF) by removing the acetyl group at the SN-2 position (By similarity). Positively regulates the activity of the minus-end directed microtubule motor protein dynein. May enhance dynein-mediated microtubule sliding by targeting dynein to the microtubule plus end. Required for several dynein- and microtubule-dependent processes such as the maintenance of Golgi integrity, the peripheral transport of microtubule fragments and the coupling of the nucleus and centrosome. Required during brain development for the proliferation of neuronal precursors and the migration of newly formed neurons from the ventricular/subventricular zone toward the cortical plate. Neuronal migration involves a process called nucleokinesis, whereby migrating cells extend an anterior process into which the nucleus subsequently translocates. During nucleokinesis dynein at the nuclear surface may translocate the nucleus towards the centrosome by exerting force on centrosomal microtubules. May also play a role in other forms of cell locomotion including the migration of fibroblasts during wound healing. Fairly ubiquitous expression in both the frontal and occipital areas of the brain. Defects in PAFAH1B1 are the cause of lissencephaly type 1 (LIS1) [MIM:607432]; also known as classic lissencephaly. LIS1 is characterized by agyria or pachgyria and disorganization of the clear neuronal lamination of normal six-layered cortex. The cortex is abnormally thick and poorly organized with 4 primitive layers. LIS1 is associated with enlarged and dysmorphic ventricles and often hypoplasia of the corpus callosum. Defects in PAFAH1B1 are the cause of subcortical band heterotopia (SBH) [MIM:607432]. SBH is a mild brain malformation of the lissencephaly spectrum. It is characterized by bilateral and symmetric ribbons of gray matter found in the central white matter between the cortex and the ventricular surface. Defects in PAFAH1B1 are a cause of Miller-Dieker lissencephaly syndrome (MDLS) [MIM:247200]. MDLS is a contiguous gene deletion syndrome of chromosome 17p13.3, characterized by classical lissencephaly and distinct facial features. Additional congenital malformations can be part of the condition. Belongs to the WD repeat LIS1/nudF family. Dimerization mediated by the LisH domain may be required to activate dynein. Cytoplasm > cytoskeleton. Cytoplasm > cytoskeleton > centrosome. Cytoplasm > cytoskeleton > spindle. Nucleus membrane. Redistributes to axons during neuronal development. Also localizes to the microtubules of the manchette in elongating spermatids and to the meiotic spindle in spermatocytes (By similarity). Localizes to the plus end of microtubules and to the centrosome. May localize to the nuclear membrane. ab2607 (2µg/ml) staining Lis1 in human testis using an automated system (DAKO Autostainer Plus). Using this protocol there is strong staining of cytoplasmic compartment of the mature spermatocyte cells. Publishing research using ab2607? Please let us know so that we can cite the reference in this datasheet. Thank you very much for your email. If we would accept your offer of a free charge of replacement, will you send another sample of the same Anti-Lis1 antibody with the same Lot number, or can you send us a new sample with the old lot number which was working in our experiments? Secondly, I have checked your website for several other Anti-Lis1 antibodies which we can use in Western Blot and also in Immunohistochemistry. 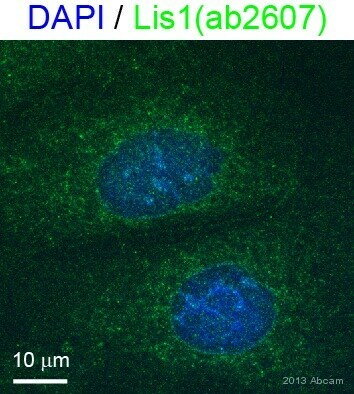 I have found two different Anti-Lis1 antibodies with the code numbers ab115357 and ab117457. But actually, in the website there were no images regarding their Western blot performance. Could you please send me some Western blot images of these antibodies if you have, or some reference articles where I can see some Western blot results regarding these antibodies? Furthermore, I would appreciate when you could advice additional Anti-Lis1 antibodies. We will not send you a sample of either a new or old lot of the ab2607 as we are not able to provide samples with over 100.000 products, but we will gladly send you a whole vial of this product, which is fully covered by our gurantee as well. So if the problem should persist, please contact us again so we can discuss on how to proceed. In addition, I will contact the lab to enquire about a WB image for the two other antibodies asd requested. I hope this is helpful to you. Please do not hesitate to contact us again if you have more question or need more information. It will be neither paraffin or fresh frozen. We perform whole-mount staining following fixation. I am very pleased to hear you would like to accept our offer and test ab2607 in IHC-whole mount. This code will give you: 1 free PRIMARY ANTIBODY before the expiration date. To redeem this offer, please submit an Abreview for IHC-whole mount and include this code in the “Additional Comments” section so we know the Abreview is for this promotion. For more information on how to submit an Abreview, please visit the site: www.abcam.com/Abreviews. Will the mouse tissue be paraffin embedded or fresh frozen, or neither of them? Thank you for contacting Abcam. I have looked over all the details that you provided and I would recommended that you increase you incubation of the primary antibody to an overnight incubation at 4C with gently agitation. If increasing the incubation time does not prove to be effective then please let me know. The antibody is covered under our Abpromise and so is guaranteed to work in western blot on human and mouse samples. If we cannot resolve this issue for you, then I would be happy. If there is anything else I can help with, please let me know. Thank you for your patience; I was away on vacation and could not reply to you earlier. As you previously used a different lot of ab2607 successfully under the same conditions, my hunch is that the latest vial that you received somehow went off. Please send me your shipping address including phone number and I will send you another vial free of charge.